It is not exactly the most romantic beginning in the wine industry. We’ve had public relations people inform us that we need a “better story”, preferably a dreamy version that involves riding on horseback through the vineyards at sunset. But Al is a firm believer in Mark Twain’s quote: “If you tell the truth, you don’t have to remember anything.” And this is the truth. 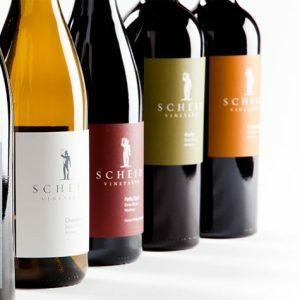 For the first 15 years or so, Scheid Vineyards was known as Monterey Farming Corp., a large grape grower that sold all of its production to large winery clients for use in their own brands. Al brought his eldest son, Scott, who had been working on Wall Street as an options trader, on board in 1986. At that point, the vineyards were in need of improvements and upgrading, such as converting all of the irrigation systems to drip irrigation, which uses much less water than the overhead sprinklers that were originally installed. In 1988, Kurt Gollnick, an admired, extremely knowledgeable and cutting edge viticulturist who had previously farmed for Bien Nacido Vineyards, was brought on as General Manager of Vineyard Operations. Phase I of the vineyard improvement began in 1989. A few years later, daughter Heidi, who had been working as a business valuation consultant after earning her MBA, also joined the business. The Gang of 4 was complete and big changes were coming fast. By the early 90’s, Scheid Vineyards was at a crossroads. The wine industry was changing. Whereas our first plantings were heavy on Colombard, Chenin Blanc and Ruby Cabernet (and even some long lost gems like Flora and Tinta Madeira), the market was demanding Chardonnay, Cabernet Sauvignon and, due to the 60 Minutesbroadcast of The French Paradox, the new darling, Merlot. In addition, a lot about farming wine grapes in Monterey County had been learned, such as which varietals grew best in which of Monterey’s many micro-climates. And then there was the vineyard scourge called phylloxera which was killing vines that were either own-rooted or on AXR1 rootstock, which a large portion of our vineyards were. In addition to these forces, most of our original limited partners were, by this time, in their retirement years and looking for an exit strategy. This is where it is helpful to point out that it was actually a very good thing that Al wasn’t riding around on a horse with his head in the clouds because then we wouldn’t be here. Instead, Al was a financial person and a problem-solver. Through some pretty intense maneuverings between banks, limited partners, winery clients and, necessarily, lawyers, the unromantic Gang of 4 managed to buy out all of the outside partners, redevelop almost every single vineyard acre, acquire an additional vineyard planted to Pinot Noir, expand their number of clients from 2 to 16, launch and grow the Scheid Vineyards label, and have a really great time while doing it. So who are we now? In our 44th year of farming, we own ten estate vineyards located along a 70-mile spread of the Salinas Valley. We built a state-of-the-art winery with a crushing capacity of 30,000 tons, as well as a smaller Reserve Winery where the small production wines of Scheid Vineyards are crafted. With 4,000 acres of vineyards, we sell the majority of our production as custom-made wines to other wineries. And happily, we are still the Gang of 4, with Al spending a little less time working and a little more time golfing, Scott heading up the operation as President and CEO, Kurt running the vineyards and winery as Chief Operating Officer, and Heidi managing sales, marketing and myriad of other duties as Senior Vice President. Our team of employees is, we believe, the best in the business. We share a likeminded attitude in that we all genuinely push for improvement at all levels, from the grapes to the glass. In the vineyards and in the winery, there is a constant stream of experiments, trials, investigations and innovations going on at all times. Our company DNA is that we’re never really satisfied, at least not for long. This shared vision is the lifeblood of Scheid Vineyards. Most importantly, we are blessed. We are fully aware that growing wine grapes and crafting wines ranks right up there as one of the best jobs in the world. So while the PR people scratch their heads and wonder how to tell our dull, unromantic story, we embrace it. It brought us here today, where we work with incredible employees who are passionate about what they do each day and we get to make an amazing product and share it with people like you. Cheers to that! Located just off of Highway 101 between Greenfield and King City, this is our “home” location set among the vineyards, just an hour’s scenic drive from the Monterey Peninsula. With a spacious outdoor deck, demonstration vineyard, bocce ball court, and more, this is the perfect place to enjoy the tranquil beauty of far-reaching views, rolling hills and row upon row of lush vineyards while tasting the handcrafted wines of Scheid Vineyards. The open venue also makes this a great place to hold a private event, such as a wine dinner, wedding or corporate event. We offer two different wine tasting flights every day. No reservation necessary. ESTATE WHITE FLIGHT: $10 per person, waived with purchase of two bottles Add a pour of our Claret Reserve for an additional $5 Add a pour of our Isabelle for an additional $5 2014 Grüner Veltliner: With loads of bright citrus, tropical fruit and honey notes on the nose, the palate shows a flinty component with citrus and lime leaf. The balanced acidity leads into a clean, crisp finish. 2013 Odd Lot White: Comprised of eight different varietals, aromas of stone fruit, tropical pineapple and citrus lead into a lively blend of fruit flavors. A soft round mouthfeel is complemented by crisp acidity and fresh fruit finish. 2012 Chardonnay: Striking an ideal balance between rich and refreshing, aromas of green apple and pear lead into a lively blend of tropical fruit and citrus flavors with a hint of vanilla. 2013 Pinot Blanc: An opulent wine with lush flavors of pear and melon alongside notes of lemon and mandarin orange. This wine has a full mouthfeel and lingering, elegant finish of vanilla and caramel. ESTATE RED FLIGHT: $10 per person, waived with purchase of two bottles Add a pour of our Claret Reserve for an additional $5 Add a pour of our Isabelle for an additional $5 2012 Grenache: Aromas of black cherry, black currant, and ripe plums mingle with delicate spice and vanilla notes. Well-balanced with soft tannins, a rich mouthfeel, and excellent depth of flavor that carries through the finish. 2011 Merlot: A stylish and versatile wine loaded with black fruit and enhanced by delicious chocolate and cinnamon notes. The bold fruit is balanced wth rich oak flavors and unfolds into a smooth, lingering finish. 2012 Triple Layer Red – Rhône Blend: Is quite delicious and wonderful all on its own, blending the lively trio known in some parts as GSM takes it to a different level of complexity. Featuring the bright, ripe raspberry fruit of Grenache, the jamminess and lushness of Syrah, and the subtle spiciness and earthiness of Mourvedre. 2011 Petite Sirah: Robust yet supple, with blackberry and dark plum aromas and notes of spicy oak and a hint of anise. The integrated tannins on the palate with the oak and dark fruit flavors meld beautifully into a long and luscious finish.